Cliffs jut out at dramatic angles along the riverbanks of the Salween River in Karen State in eastern Burma, known officially by its government as Myanmar. The lush landscape is a backdrop for one of the last free-flowing rivers in the region. On the riverbank, villagers stand over the remnants of a market they say was burned to the ground in recent clashes. Khu Hser came to the river to catch a boat to the closest town, where he plans to trade the fruits and nuts he has picked. Teacher Khu Hser says he had to shut down the village school when fighting neared his village. Khu Hser is the only school teacher in his tiny village deep in the jungle. When fighting erupted near his home in July, he closed down the school and fled with his family, pushing deeper into the jungle for safety. "We left before the soldiers arrived in our village," said Khu Hser, who ran into the jungle with his children, carrying all of their belongings. "We had to build a temporary shelter and find food to eat because there was no more food," he added. Khu Hser was forced to shut down his village's school in June. The fighting has kept Khu Hser away from his home for more than a month. He and his family are now among the estimated 500,000 internally displaced people in Burma. 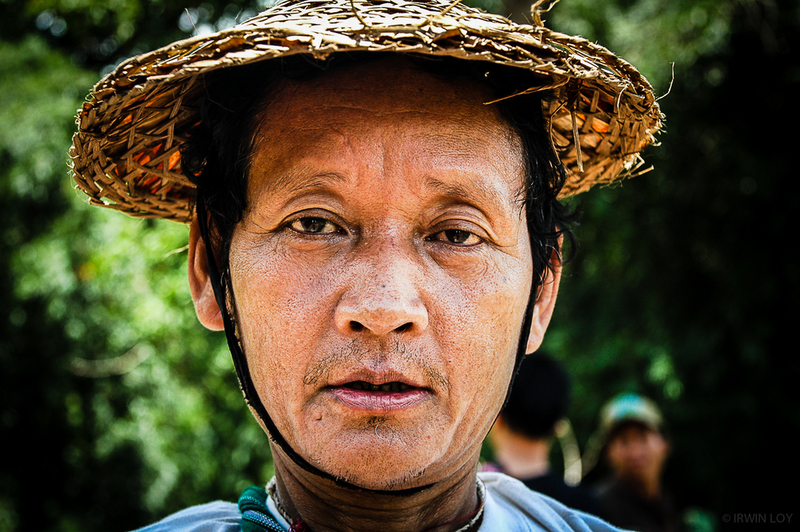 Khu Hser is an ethnic Karen, one of the many minority groups living in the fractured country. The Karen have been locked in a decades-long battle for autonomy in which successive military regimes have failed to establish lasting peace among the country's armed ethnic militias. There is now a new reason for conflict in this area. The government plans to build a dam near Khu Hser's home. But this is territory claimed by the Karen National Union (KNU), the political organization representing the Karen people. The resulting clashes between Burmese soldiers and the KNU's military wing have sent many villagers running. New en Paw fled with her family in April and still hasn't returned home. She is worried about her children's future because they can't go to school. "If they don't have school, how will they survive when they grow up?" she wondered. The Burmese government has almost 50 hydropower projects in the works including seven along the Salween River. The situation is mirrored throughout the country in extensive mining projects, natural gas pipelines, a controversial deep sea port and forestry and agricultural concessions. Many of these projects are found in Burma's resource-rich ethnic states, like Karen State, where the battle between Karen rebels and the Burmese government has carried on for six decades, making it the longest-running civil war in the world. This is the beginning of a massive move to develop natural resources in Burma, one of the poorest countries in the region. Investors from China, India and neighboring Thailand have agreed to invest in these potentially lucrative sectors. The biggest hydropower projects could bring in an estimated 2.9 billion euros ($4 billion) in revenue each year. Along the Salween River, territory changes hands frequently. The Karen army controls the area immediately surrounding its checkpoints. At other points just a few kilometers away, the checkpoints belong to the Burmese military. At one checkpoint, Ba Bluh, a captain with the KNU's military wing, peers through a pair of binoculars, inspecting boats approaching from the Thai border. The KNU is opposed to the dams. Ba Bluh said the conflict is likely to escalate if Burma insists on developing in conflict areas. The Burmese army must resupply its frontlines with food and ammunition, but the KNU opposes this. "If the dam is being built, they will send more troops to control the area. When they send more troops, there will be fighting," Ba Bluh said. Ba Bluh, a captain with the Karen National Defence Organisation, waits at a military checkpoint along the Salween River in eastern Burma’s Karen State. The Karen are engaged in the world’s longest-running civil war with the government of Burma, officially known as Myanmar. The government’s new push to develop the country’s natural resource is fueling new levels of conflict with ethnic militias. Karen children sit in a boat docked along the Salween River in eastern Burma’s Karen State. The children come from families that have been pushed from their homes because of clashes between the Burma Army and Karen rebels. The Burmese government’s push to develop natural resources, including seven major hydropower projects on the Salween, is fueling new levels of conflict with its armed ethnic militias. Across the country, similar battles over resources are playing out in areas that are home to ethnic minority groups. Earlier this year, a 13-year ceasefire between the Burmese Army and the Kachin Independence Army crumbled. The two forces clashed near the sites of hydropower dams, and the fighting sent 13,000 civilians fleeing for safety. Disputes over natural resources are not the only reason for the conflicts in Burma, but they are exacerbating an already perilous humanitarian crisis. Estimates from the Thailand Burma Border Consortium, an umbrella group which works with refugees, suggest that more than 3,600 settlements have been displaced in eastern Burma over the last 15 years. More than 73,000 people fled their homes between 2009 and 2010. "It means they have to abandon their farmlands, their house and either go away from their original village or come to the border and cross into refugee camps in Thailand," said Paul Sein Twa, a coordinator with the Burma Environmental Working Group. This protracted displacement is causing a troubling health crisis. Near the Burmese border in western Thailand, a team of mobile health workers called the Backpack Health Worker Team specializes in bringing much-needed health care to displaced people within Burma. The teams trek, sometimes for days at a time, to remote villages where there health services are limited. Malaria, diarrhea and war injuries are some of the most persistent dangers, said the group's director Mahn Mahn. The death-rate for pregnant women in war-ravaged eastern Burma is comparable to figures in Somalia and the Congo. Malnutrition rates in some of the worst-hit areas are critical. The recent clashes over natural resources have only made the health situation worse. Mahn Mahn believes the hydropower mega-projects are creating human rights violations. "Without stopping the human rights violations, we won't see health improvements in these communities," he said. In recent weeks, opposition figure Aung San Suu Kyi has offered to act as a mediator between Burma's government and its ethnic militias. In areas like Karen State, however, dams and other development projects may continue to be a stumbling block on the path to lasting peace. This story was first aired on DW radio's World in Progress.